Although many industries have been pursuing improvements in their business operations centered on the introduction of IT to increase their business efficiency in recent years, the fresh produce industry has fallen behind. Consumer awareness of matters concerning food has risen to high levels, meanwhile, and demand has grown for low-priced, safe, secure products. Operating in these circumstances, Farmind has planned, developed and provided the market with a number of systems, including our proprietary eON, FAN'S and N-System services for fresh produce ordering, shipment sorting and distribution management that contribute to enhancement of ordering and logistics as well as to improvement of traceability. Our mission is to construct distinctive systems capable of securing accuracy and ensuring that the “ambiguities” arising in fresh produce distribution can be accurately absorbed to enable proper execution of operations. In stark contrast to other businesses, the fresh produce business experiences frequent fluctuations in conditions such as growing locations, product grades and prices, as well as extremely short periods from order placement/receipt to shipping/delivery. These conditions have hindered efforts to achieve desirable progress in industry-wide introduction of IT. Farmind has responded with a variety of cloud-based systems suited to the needs of individual distributors. These systems adjust to differing operational characteristics, depending on the company, through proposals and customization for enhancing execution. The result is systems that enable effortless use by all operations personnel, while at the same time eliminating waste from distribution. We fine-tune our services by conducting reviews as needed following system delivery aimed at improving operating efficiency further. We currently offer three cloud-based systems—one each for producers, intermediate wholesalers and retailers—and propose modifications to tailor them to the actual circumstances of individual companies. Each can operate effectively as a stand-alone system, but interconnecting multiple systems and operating them concurrently can intensify their power synergistically. FAN’S is a cloud-based system that supports efficient, accurate execution of transactions between producers and intermediate wholesalers. It enables on-line conduct of daily ordering and inventory management. Linking records of transactions performed using FAN’s with other systems simplifies the procedures involved in invoicing and shipments. Operational ambiguities are resolved, and compliance is improved as a result. N-system is designed to facilitate intermediate wholesalers’ purchasing and sales management operations. It unifies management of both commercial distribution (from purchase order placement to invoicing) and commodity distribution (from receipt to shipment of merchandise). This enhances not only operating efficiency but also traceability, contributing to enhanced food safety and improved operations accuracy as well as to management of gross profits on individual products. 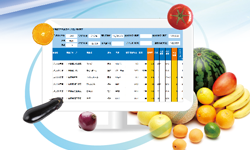 Incorporating the results of supply-and-demand adjustments, a unique feature of the fresh produce business, into the system simplifies daily operations further. This online ordering system is an invaluable tool for supermarkets and other retailers. Fresh produce retailers often have very little time between announcements of product availability and ordering deadlines, an aspect of the fresh produce distribution in which speed is of particular importance. These circumstances, which make it virtually impossible to perform settings for daily system use and maintenance, constitute a major obstacle to progress in the introduction of IT. eON’s excellent operability and its design that minimizes maintenance work make it easy for computer and Internet novices to use it from the beginning. It simplifies normally burdensome ordering tasks, freeing staff to concentrate on such other important duties as finding new products. We have been interviewing large numbers of customers over the years to deepen our understanding of their operations and reflect it in our systems in order to address current issues facing the fresh produce industry. Today, we are drawing on the fund of knowledge and know-how accumulated through these activities in efforts to discover completely new value in fresh produce and offer innovative business mechanisms that never existed before. Supermarkets want to purchase not only the safe, reliable produce consumers demand, but also local specialties and other rare or unusual products from regions throughout Japan. But these products are not available from the stores’ usual suppliers such as intermediate wholesalers and produce markets. We fill this gap by providing services that enable them to procure local specialties from markets nationwide, thus giving consumers the opportunity to purchase items they really desire. In other words, we provide opportunities for consumers to purchase items they have wanted to buy but have been unable to find. Local specialties that are deeply rooted in regional cultures are sold at wholesale markets throughout Japan. Many supermarkets would like to offer these special items to their customers, but they are unable to acquire them due the complexities of distribution and purchasing. 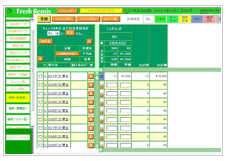 The hontonoichiba.com site searches out and transports regional specialties with particular appeal and then handles the account settlement. 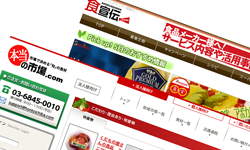 This enables any supermarket to stock regional specialties from throughout Japan. Unlike ordinary online stores, it adopts the perspective of its supermarket clients and supports them with recipes, product POPs and other sales promotion materials. As an additional benefit, the site makes these special products available to restaurants and homemakers as well as to supermarkets. This SNS marketing site connects consumers with producers to facilitate mutual communication concerning fresh fruits and vegetables. It provides a framework for wide-ranging exchanges of information on products, campaigns, dietary education and recipes as well as for reports on discussion meetings. The site aspires to serve as a venue for comprehensive information exchange concerning a full range of foods, from fresh produce to sweets and beverages.